...and much more! We believe in delivering lots of value for your money, so the TExES Mathematics 8-12 (135) Flashcard Study System is packed with the critical information you'll need to master in order to ace the TExES Mathematics 8-12 exam. Study after study has shown that spaced repetition is the most effective form of learning, and nothing beats flashcards when it comes to making repetitive learning fun and fast. TExES Mathematics 8-12 (135) Flashcard Study System uses repetitive methods of study to teach you how to break apart and quickly solve difficult test questions on the test. Our flashcards enable you to study small, digestible bits of information that are easy to learn and give you exposure to the different question types and concepts. With our flashcards, you'll be able to study anywhere, whenever you have a few free minutes of time. Our company has helped thousands of people achieve their education goals. 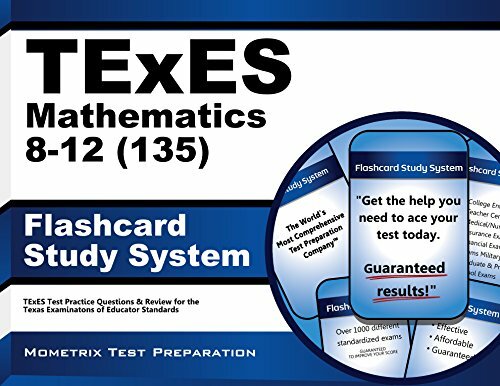 TExES Mathematics 8-12 (135) Flashcard Study System can help you get the results you deserve. Here's a little "secret" about the TExES: the TExES is what we in the test preparation field call a "content driven" test. While some tests are looking to see what you are ABLE to learn, the purpose of the Texas Examinations of Educator Standards (TExES), offered by the Texas State Board for Educator Certification (SBEC) and Educational Testing Service (ETS), is to test your understanding of what you have already learned. The goal of the TExES is to use a standardized testing process to create an objective assessment of a test taker's knowledge and skills. You can succeed on the TExES by learning critical concepts on the test so that you are prepared for as many questions as possible. Repetition and thorough preparation is a process that rewards those who are serious about being prepared, which means that succeeding on the TExES is within the reach of virtually anyone interested in learning the material. This is great news! It means that if you've been worried about your upcoming TExES, you can rest easy IF you have a good strategy for knowing what to study and how to effectively use repetition to your advantage. If you tried to memorize every single possible thing you can for the TExES, the field of possible things to review would be so huge that you could not hope to cover everything in a reasonable time. That's why we created the TExES Flashcard Study System: we have taken all of the possible topics and reduced them down to the hundreds of concepts you must know and provided an easy-to-use learning method to guarantee success on the TExES. Our cards include in-depth explanations- you won't see any "one word" answers on our cards that require you to go get a textbook to understand why your answer was wrong- all of our cards include generous, thorough explanations so you not only get it right or wrong- but you also know why! It's easy for a friend to help you study- they don't even have to know anything about the TExES- if they can read, then they can quiz you with our flashcards! Now, let us explain what the TExES Flashcard Study System is not. It is not a comprehensive review of your education, as there's no way we could fit that onto a single set of flashcards. Don't get us wrong: we're not saying that memorization alone will automatically result in a passing TExES score- you have to have the ability to apply it as well. However, without the foundation of the core concepts, you cannot possibly hope to apply the information. After all, you can't apply what you don't know. If you think there's even the smallest chance that these flashcards will help you, you owe it to yourself to try them out. Don't let fear or doubt stand in the way of your opportunity to achieve the test score you need to fulfill your dreams.